I've been reading new books and re-reading books on my shelf lately and because everything is piling up, I figured I'd share snippets of the books that have been passing through my thoughts of late. Pearl Girls is a new little gift from Moody Publishers. It is a compilation of the personal stories of women who have known what it feels like to get a little grit in their lives. Compiled by Margaret McSweeney, she explains that she wanted to share the stories of individual women who have suffered from a variety of troubles and who have begun to see how God used those exact trials and troubles to refine them. There are stories about women who suffered emotional abuse, physical abuse, loneliness, single motherhood, and crisis pregnancies. What struck me about the book was not that these individuals were facing horrible and scary situations. What shone through is each individual story-sharer's relationship with God and the peace she was left with in return for her trauma. These stories radiated hope. I was a little afraid that this book would focus so much on the struggles that that would be all I would see, but that was not the case at all. The Bible says that God has a future and a hope for us and instead of feeling "down" after reading this book, I felt lifted up and encouraged. 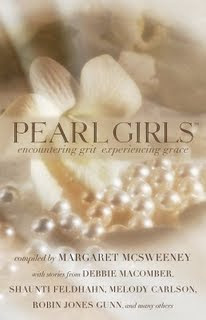 God sends "grit" into our lives to refine us and make us beautiful pearls. As McSweeney explains in the introduction to this book, she sees these women as a string of pearls which does provide a very beautiful mental image. Instead of feeling wary about Pearl Girls , I am delighted with the focus on God's perfection in timing, care, love and concerns. There are sixty-five stories within these pages and not a one of them hurls curses at God, demanding different lives and life situations. Each one humbly bows her heart to her Creator, accepting His will and thanking Him for it! This is a beautiful book as a result. Not every story is dramatic in that not each person was traumatically abused. Some women simply shared how God grew a servant's heart within them, working in them through ordinary situations. Some women "simply" dealt with pride, some with hurt feelings. Still, all recognized that God had a plan for their good in each situation. For inspiration, a pick-me-up, a reminder that you are not alone in your sufferings or just to encourage you to look at your daily struggles (e.g., too many errands to run, not enough quiet time, etc.) as God's means of refining your character - this book is, well, . . . beautiful! 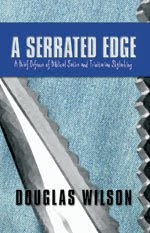 A book that would not seem quite so beautiful to others, but one that I have on my bookshelf and pull out from time to time, is Doug Wilson's A Serrated Edge : A Brief Defense of Biblical Satire and Trinitarian Skylarking. I can't help it. I love this book. I am drawn and disposed to it, you might say. Ok, so if you are familiar with Doug Wilson and his style, you already know that he often comes across as brash, arrogant and pokes too much fun at things other Christians are doing. As a Christian, this can be somewhat riling if you are staring at the fingers he extends to tickle you with. Those that disagree with him often react recoil in indignation and sometimes, I have to say, they have every right to. Sometimes I've read what Wilson has written and thought to myself, "Now why did you say it like that?!" However, having had the privilege (yes, the privilege!) of having him for my pastor for almost a year when I lived in Idaho, I "hear" what he says in print a little easier. He writes very much in the manner that he speaks and I think there is something to understanding Wilson by listening to him talk. When you hear the way he approaches speeches and every day conversation, some of the things that make you scratch your head end up just making you chuckle. And all of that is simply my introduction to Wilson and has very little (in actuality!) to do with this book. People's complaints about Wilson (well, one of the complaints anyway) is that he makes too much fun of what they consider to be holy. He is thought irreverent. A Serrated Edge is his 115 page response in defense of his style. Briefly stated in a blog post, the defense is thus: If what the Bible says is true and we are to be like Jesus, then we have permission to speak as he did, pointing out flaws and poking fun of the leaders of the day to illuminate truth and damage lies. As a woman reading this book, I am split. On the one hand I agree that a woman is to have a gentle and quiet spirit, answering carefully, wisely and well the situations that she is presented with. On the other hand, I feel that woman should increase their understanding and be discerning. Also, I think that ANY Christian, male or female, should learn when to answer a fool according to his folly (Provbers 26:5) and when to not answer a fool according to his folly (Proverbs 26:4). Jesus said some pretty pointed things to people as He shared the truest, most holy and accurate gospel. Sometimes he wasn't very "nice" about it. In short, I think that sometimes we are called to give a gentle answer to a folly and sometimes we are to speak directly to it (i.e., "harshly" if you will, and with humor to point out the flaw!). There is a balance. I haven't found it. But it does exist. I have a great many more thoughts I could share on this book, but I'll leave it there for now. In short, I think it provides a great deal of food for thought. So here you have this edition of "Short Takes" from Carrie. The Beauty and the Beast. A rather marvelous study in contrasts for today! I want to read Pearl Girls -- one blog friend is a contributor. I think writers/speakers/preachers have to be very careful with satire simply because it can be taken so wrongly. I don't think satire always equals ridicule. II Timothy 2:24-25 says, "And the servant of the Lord must not strive; but be gentle unto all men, apt to teach, patient,In meekness instructing those that oppose themselves..." I think that gentleness and meekness trumps satire. Plus being satirical can be very satisfying to the flesh, which is not always a good thing. Barbara - I've sat on your comment for a couple of days just thinking about it and I think I conclude that you are absolutely right. Gentleness and meekness trumps satire and still the truth can be communicated. STILL thinking about it but resolving my mind towards the gentleness because of the word "trumps" which rearranges things in my mind. Thanks for taking the time to leave a comment and for giving me something to chew on.